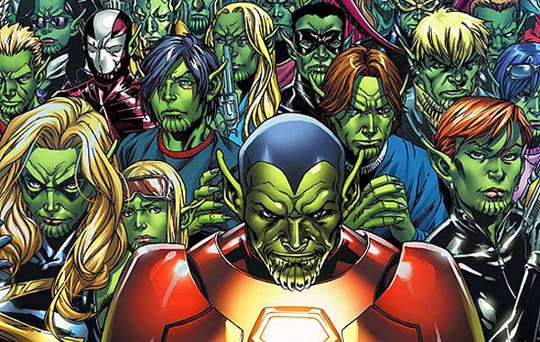 The Skrulls are coming to the MCU, and for fans of the shapeshifting aliens that should be pretty exciting. Last week at Comic-Con we learned some details on the upcoming Captain Marvel film starring Brie Larson, and along with a piece of concept art revealing her in costume, we learned the setting would be in the '90s, and that the Skrulls would be her foes. The Skrulls are aliens who have faced pretty much everybody in the Marvel Universe, but they are primarily seen as Fantastic Four enemies. In fact, Marantz uses #superskrulls in his caption, which is a reference to Kl'rt the Super Skrull, a character that actually belongs to 20th Century Fox. The Skrull race is open game, though, and I assume Marvel could simply use a different Super Skrull than Kl'rt since there are a bunch of them. Now, this does open up the question of why the movie takes place so long ago, well before Tony Stark first dons the Iron Man suit, and why Captain Marvel isn't around right now to join in the fight against Thanos. My guess is that she is either a prisoner of the Skrulls at the end of her movie, or off in deep space fighting them, and will reappear in time for Avengers 4. Or, she's been kept on ice (not literally) by SHIELD, and that's why we have Samuel L. Jackson's Nick Fury in the movie, because he knows where she is and employs her as a last ditch weapon. I'm also guessing the next Marvel phase will be a take on Secret Invasion. Why introduce the Skrulls if you aren't going to use their most prominent recent storyline? Or perhaps we'll see a version of the Kree/Skrull War? Captain Marvel opens March 8th 2019!